Please to go to our storage space estimator. Lok'nStore storage rooms / units are between 6 and 12 ft. high and are available in a variety of sizes. Generally the centres can offer rooms between 25 sq. ft. and 150sq. ft. at steps of 5 sq.ft. Many of our centres can also the facility to store larger items on pallets in open storage areas - please contact these local centres for more details. Some of our centres also have outside units. This storage gives you the extra benefit of 24-hour access. What Can I Store? Is there anything Lok’nStore cannot store? Households, businesses, entrepreneurs, collectors, new families, downsizers, jet setting world explorers…..It would be rare that you didn’t need storage at some time in your life. From trying to free up valuable space within the home to de-cluttering the house when preparing it for sale. We also see customers who are bridging the gap between one home and another or when moving from a large home to a smaller one. You can store possessions if you are going abroad. It’s useful for storing seasonal items such as clothes and sports equipment, or for storing bulky leisure items like skis or windsurfers, bicycles or canoes. If you think you need storage call an expert at one of our local centres who can help you find the right size and arrange for your space to be reserved so you only pay when you need it. No problem just let your friendly store team know. One of the benefits of our flexible storage solutions means that you can increase or decrease the size of unit you occupy as your needs change, so you never need to pay for space you are not using. 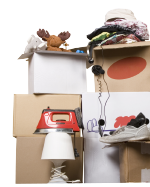 You can change your unit/space at short notice and we will help you as long as we have the space. What happens if I reserve the wrong size and it's too big or too small? No problem just let us know. There's no charge for changing units and you will be invoiced only for the unit you use, as you use it. Talk to the people at your centre and they'll show you the alternatives. Please to go to our tips page. The minimum is one week but there is no maximum stay. The notice period is just 7 days at any point whilst in storage. You can move in straight-away (subject to availability – reserve a unit today to secure your space). That could be the same day you contact us or by arrangement, at your convenience. The notice period is just 7 days at any time. But you can move your goods out during those 7 days if you want to. No you don't have to, but many of our centres have offers on different lengths of stay. Call you local centre today to get the right space at the best price. Please see our open hours page. Does Lok'nStore hold a key to my unit? If you want to hold a copy at the centre, the manger will secure the key for you without a charge, to be given only to you or others upon your written request. Can Lok'nStore provide the locks? Yes, you can bring your own padlock or you can buy a padlock when you arrive. We do not need to keep a key - you are the ONLY keyholder. Two forms of ID, one should be photographic (driver's license, passport etc). An alternative contact name address and phone number. A padlock (we sell them if you forget). Payments are based on four weekly periods. The best way is to pay by direct debit, because you can fill out the form and then forget about it. If you choose direct debit, please bring with you the relevant information. We also accept credit/debit card, cheques or cash. Why do I have to sign in at reception each time? We ask you to sign in so that the team are aware of all customers in the building at any time. We take the security of all our customers possessions very seriously. At any time during our opening hours. And remember unlimited access is always FREE! You must check in at reception each time for the security of the centre and others. Yes, you do need to insure your goods whilst with us. You can change the value insured at any time. Should you already have a policy that covers whilst in storage, that’s no problem. All we ask is to see proof of that policy. Yes we do and it is included in your quote, so you won't pay a penny more than the price you see. As of 1st October 2012, all self storage companies have to charge VAT on self storage.